Almost every day my inbox announces the arrival of another solution that will earn me a seven digit income passively. All I need to do (right now) is buy their plugin – for only $16. And while these promises are too good to be true, the idea of passive income, of recurring revenue, made off of a WordPress membership site still call out to content producers. Is this just the quest for the almighty dollar? And aren’t their enough membership plugins out there already? Given that demand, and it’s constant growth, you would have thought by now that the market for WordPress membership plugins would have reached a saturation point. There are tons of well known players out there – S2Member, WishList, WPMUDEV’s Membership, as well as less-known but seriously fantastic plugins like Paid Memberships Pro and Restrict Content Pro. But the makers of Pretty Link Pro and Affiliate Royal have stepped into the market with their own offering: MemberPress. When people tell you about a first mover advantage, smile and then point to MemberPress. Because they aren’t the first to produce a membership product. And while I haven’t spoken with Blair Williams, I’m pretty sure he’s not worried about it at all. After all, he was able to look at each existing plugin and take the best from each, step aside from the challenges of each, and create a product that is easy to configure, fast to deploy, and powerful in scope. I won’t bore you with tons of screens – they have that on their site. But I will tell you about my favorite screen: the rule screen. 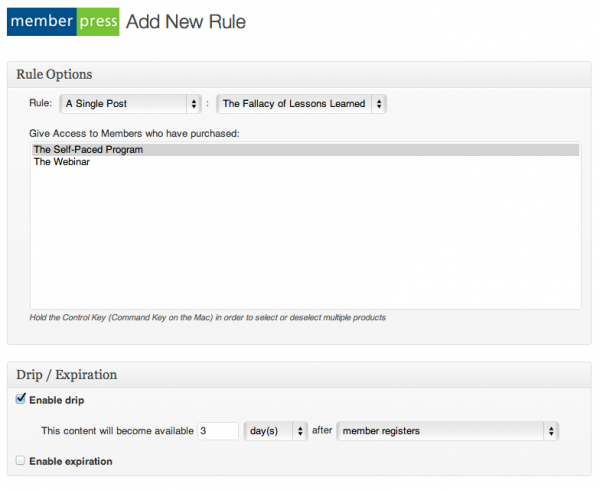 If you’ve read my earlier review of membership plugins you know that content dripping is one of those “must-have” features that is often neglected. It’s because a lot of sites go up with a little content. It’s only after a while that you realize there may be some benefits from dripping content rather than making everything available at once. But whatever the reason, I find that it’s a constant late addition to requirements and typically becomes a challenge for many membership plugins. So it is wonderful to see the content dripping feature appear seamlessly at the bottom of the rule screen. And the rule screen is easy to use – without a lot of complexity but still much more expressive than simply marking which categories a membership has access to. This is more granular (you can pick pages, page children, posts, and more). One of the things it introduces is the notion of pricing groups. This essentially acts like a container to hold a group of membership plans. But the benefits aren’t just cleaner organization. Instead, where it really pays off is that the group allows you to assemble pretty pricing grids. You know, the kind that everyone likes, with benefits, prices and call to action buttons at the bottom. I say “assemble” but that’s a lie. It does it all for you. Automatically. That’s pretty nice for the non-designers in the room. As I’ve said before in any membership plugin review, if the only gateway option is Paypal, you’re doing your clients a disservice. I’m a huge fan of Stripe, even if they only support the US and Canada as of this writing. That said, the fact that the plugin supports Paypal, Authorize.net Strip and more makes it a huge hit. Assuming you have a private IP and an SSL certificate on your site, Stripe takes on most of the PCI compliance risk for you. And that’s always great news. I can’t tell you the number of times that I’ve skipped the early release of a plugin, only to find out later that prices changed, terms changed, and I found myself on the outside of a club that was reaping the benefits of being first movers. When it comes to plugins, being a first customer has it’s benefits: namely being grandfathered in. I have no idea how their pricing will ultimately change, but I can tell you that $99 for a developer license, for one year is a great price. I don’t know how much you pay yourself an hour, but at that price even the most conservative estimates suggest a same-day return on investment. Not sure MemberPress is for you? Paid Memberships Pro – It’s free. Restrict Content Pro – It has tons of add-ons. WPMUDev’s Membership – It supports multisite and buddypress! S2Member – It’s powerful once you get past the learning curve.